Today every seventh couple is facing the problem of infertility. Most of the ladies plan their childbirth after the age of 35. Reproductive capability of women reduces at this age. Due to this women face infertility problems. Therefore, it is important for a woman to plan her child birth along with career planning. This is what chief speaker Dr Shivani Sachdev Gour of Delhi said in a CME arranged by Gwalior Obstetric and Gynecological Society (GOGS) on Sunday. She said that to treat infertility, these days, various techniques are available like IUI, IVF, Surrogacy etc. She further said that many women have been successful in getting a child either by IN VITRO FERTILIZATION or through a SURROGATE mother. But every lady cannot avail this technique as it is expensive and needs to follow strict rules and guidelines. Due to this every year only 4 to 5 thousand ladies can be a surrogate mother. Polycystic Ovary Syndrome (PCOS), Fibroid in the Uterus, Anaemia, Thyroid Problems, Blocked Fallopian Tubes, and Candida etc. cause infertility in women. Similarly heavy drinking, smoking, obesity, high stress, irregular painful periods, malnutrition also are some of the key factors in causing infertility. Eminent Gynecologists and Obstetricians of GOGS assembled for a day in a CME. The main objective of the CME was outlined by Dr Kusum lata Singhal, the head of the society. Dr Jyoti Bindal, Dr Pratibha Dalmia, were also present in the event. 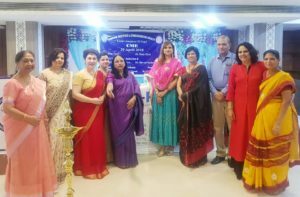 Among the Gynaecologists present were Dr Roza Olyai, Dr Ratna Kaul, Dr Rita Mishra, Dr Yashodhara Gaur, Dr Archana Maurya and others. Dr Kirti Ghore moderated the event. Previous Previous post: Is Age a Big Factor for The IVF Treatment? Next Next post: Grateful Parents from Tanzania! !